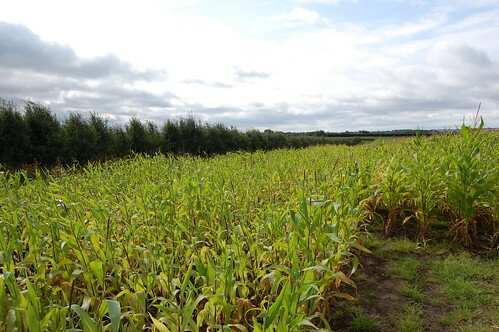 Maize Maze, originally uploaded by indiaeden. Today we had fun getting lost in a maize maze. we've never been to one before and were not sure what to expect. We got there early expecting rain,but the sun came out and it turned into a lovely day. we are already planning a trip back there next year,when hopefully Sid will be up to walking the whole way. Still painting the kitchen,pics tomorrow. Did you go to the one at Red House Farm? We went on Saturday and had a great time! Yes! I thought it might be horribly over commercialised,but actually it was pretty good,and all the young helpers (students?) were so lovely. A slingmeet there next year would be fun don't you think? A slingmeet there would be great. I must admit I did feel a little bit sorry for all the people trying to push strollers around the maze. I didn't see any babywearers this year, I saw a few Bjorns last year.